Subtract light heavyweight king Jon Jones (Pictured) from the equation and not too many people would be talking about Saturday’s “UFC 152: Jones vs. Belfort” event. Thankfully, the Gambling Gods know exactly what to do in order to make things a tad bit more interesting. 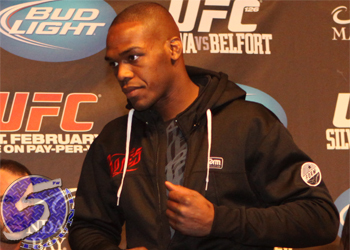 Jones remains a whopping 8-to-1 odds-on favorite to steamroll Vitor Belfort in the show’s featured attraction. “The Phenom,” on the other hand, is pegged as a 5-to-1 underdog to dethrone Jones. Is it worth it to bet so much on “Bones” to win so little? Can the Brazilian turn back the hands of time and serve up the upset special? UFC 152 jumps off inside Air Canada Centre in Toronto. I guess we’ll find out then.